Assistant Chief Larry Creekmore is primarily responsible for Operations and Training. Chief Creekmore started his professional career in 1983 with South Kitsap Fire. He has been with the DuPont Fire Department for 13 years, as of 2018. 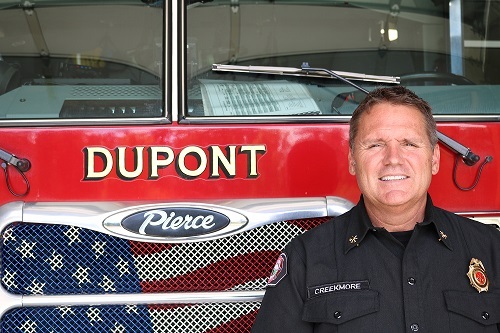 Chief Creekmore is a former Fire Chief in DuPont and in addition to his current administrative duties, he serves as a first-line responder when needed. Captains in DuPont operate with three shifts which include one captain assigned to each shift. Each Captain is assigned the following primary areas of responsibility: EMS, Public Education/Reserve Program Facilities, and Equipment. Aside from being a primary EMS training program coordinator, the EMS Captain establishes accountability for completion of required training and Recertification. The Facility Captain is responsible for building maintenance to include inspections, safety, record-keeping and scheduling. The Equipment Captain is responsible for assessing equipment condition, needs, developing inventories, accountability, and equipment maintenance and repair. The Public Education/Reserve Program Captain is responsible for coordinating Public Education events and recruitment and intimal training of Reserve members. Captains also conduct personnel evaluations for firefighters on their shift. For EMS calls, the Captains are the primary triage officer and are responsible for establishing a treatment plan. For fire suppression calls, the Captains are responsible for making strategy and tactical decisions for containment and extinguishment. All of the Captains are Certified Incident Command Officers and, at all times, the Captains are the primary Safety Officer for the Fire Department personnel as required by law. All firefighters must have Firefighter 1 certification, EMT certification, be driver/pump operator-qualified and need to be able to perform in the Captain's position if staffing requires. In addition to emergency medical and fire suppression responses, firefighters must be qualified for business and sprinkler inspections. They are also expected to represent the department at community events and be able to instruct for various public education classes.